Conservation framing aims to protect the longevity, while enhancing the beauty, of a piece of art. 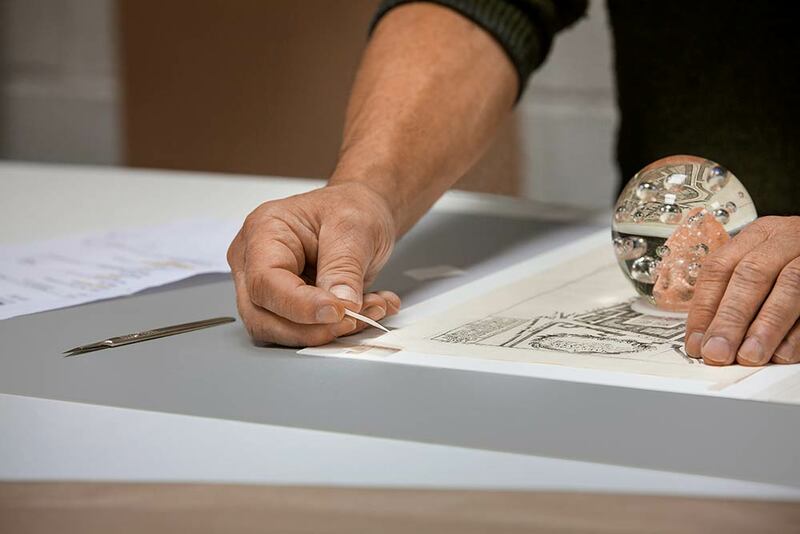 Specialist methods, materials and reversible techniques are designed to preserve artwork while ensuring that the artwork can be released, if necessary, from the framing with minimal material change. Acid-free materials and archival methods with neutral, reversible, mounting of artworks, spaced away from UV-filtered glass using mounts or wrapped fillets. In addition to all the features of conservation level: highest UV glazing, cotton rag mounts, Japanese hinging and extra isolating materials are used. Also known as window mounts, mats or passe partout, we have a large range of acid-free, light-fast, conservation boards and 100% cotton rag museum boards. Washline, laid and wrapped mounts, shaped and multi-aperture mounts are a speciality of ours. Our standard is a waterwhite glass this is supplemented by a range of coated UV-filtering and anti-reflection glass. We also offer scratch-resistant, UV filtering and anti-reflection acrylic. Genuine and reproduction antique glass and mirror may be available from stock. The reverse of the frame won’t normally be seen but it is important to know what's involved: paper taping, acid-free Artbak, subframes, split baton, security fixings, secure hangings and the strongest synthetic cord . Our labels show glass used, an order number for future reference, brief conservation advice. Corner protection and wrapping for transit.